In celebration of my blog's one year birthday, I thought it would be fun to host a little giveaway! It's actually my very first & I am super excited to offer one lucky reader the chance to win their own copy of some of my recent favorite things! 1. I have a growing collection of UglyDolls, I keep saying they are for my future children, but realistically they just make me smile. I keep a few in my studio to keep me company. 2. The Q&A 5 year journal prompts you daily with fun little questions & with 5 slots per page to record, it will serve as a fun way to look back & compare over 5 years. 3. Wreck This Journal is also a little journal/sketchbook that provides prompts to step outside of your normal comfort zone (it's great when you need a break & are brainstorming ideas)! There is also this "wreck this journal" flickr group, where people share the images of what they've done to their journal. I enjoy these items on a daily basis so I thought you might too! To enter to win just leave a comment on this post! For additional entries, you can tweet about the giveaway (let me know you tweeted with a separate comment). 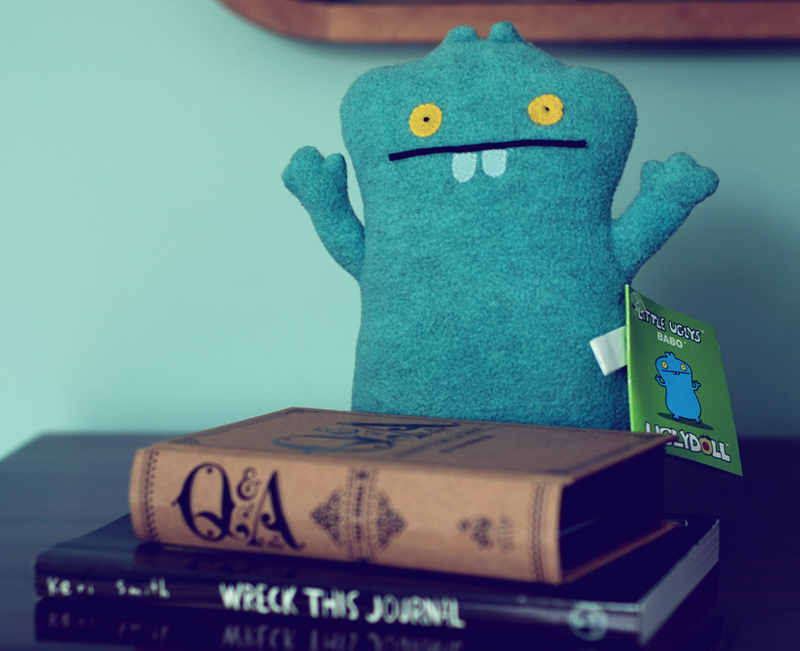 i love ugly dolls! and those journals look so fun to write in :) congrats on your one year blog anniversary ! How fun is this giveaway? I would love to win! Oh my, I love the journal! What a great giveaway - Love that ugly doll! Happy Blog Birthday! you have no idea how much i'd love to win this giveaway - i've wanted both of these books for i don't know how long! and that ugly doll is adorable! awesome giveaway. its just been my blogs 1 year birthday too! exciting stuff. I love your blog! I gather new ideas for my own place from your musings! =) Hopefully I'll have my own blog up soon! I'll let you know! 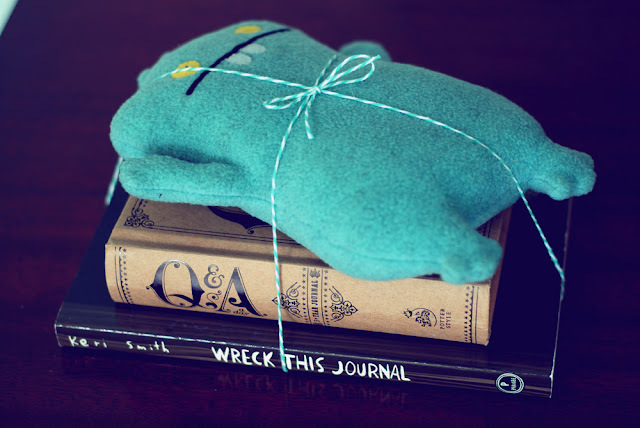 <3 ugly dolls! Crossing my fingers that I'll win! Keep it up!! I love your blog! I get a lot of ideas reading about your musings! Hopefully I'll have my own blog at some point to show you what you've helped me achieve!! What an adorable give away! These things are all so awesome! I don't have an ugly doll, but every time I see one I want to buy it! And I've been telling everybody that I really want to start keeping a journal! Love it. Cutest giveaway ever. I've had my eye on that 5 year Q and A book for a while now... Thanks for the chance to win! I love following your blog, chica. I just came across your blog a week ago and I love it! awesome giveaway! I've only been blogging since february! i'll have to keep this in mind for my 1 year anniversary! Journaling books sound amazing! I always need a good prompt for mine! Happy Birthday Blog Giveaway WINNER!